Skin cells are renewed every 28 days. Mirroring this same regenerative rhythm, Sensitive Care Conditioner should be used for 28 days. We recommend one such treatment per year for each decade of life (for example three times a year at the age of 30). Apply each morning and evening after cleansing. Break off the top of one ampoule and press gently and evenly into the face (including the lip and eye areas), neck, earlobes and décolleté. From week 4, only use 1 ampoule in the evenings. 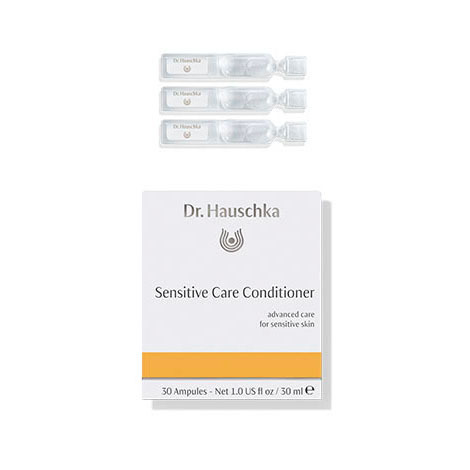 Dr. Hauschka Skin Care's oil-free approach to nighttime skin care respects the skin's inherent wisdom. Heavy, oily night creams do not allow the skin to "breathe" and can inhibit the skin's natural functions when it is most active. At night after cleansing, apply only non-oily Dr. Hauschka Renewing Night Conditioner, Sensitive Care Conditioner, Facial Toner or Clarifying Toner.